I tried PocketSnes on my Amiga600 with Vampire 2. It works good but is to slow to be playable. I get 7-10 FPS. PocketSnes should get some Ammx optimization to be a good SuperNintendo emulator like GnGeo for NeoGeo. There are tons of good SuperNintendo games. Yes but first finish GnGeo port. All it is a console that plays fighting game, shoot up games and arcade. Not much. Best 1990 m68k based console and 2D champ, game sys of its age a la Sega Master Sys look laughable - it has 2D GPU and dedicated sound chip that eats away AGA. That made some nice titles not seen as on other European/US consoles. SNK Product, famous for arcade machines. We are honored to have it on reVamped Amiga, cause its something beyond Classic Amiga. You make it sound like NeoGeo have better hardware spec over A1200 or A4000. For gaming the NeoGeo HW is much stronger. haven't we now made Amiga much stronger in HW over NeoGeo for gaming and everything else? Debatable. The 14MHzs 68EC020 is much faster than a 10MHz 68000. Hires HAM6 is almost as good as the NEOGEO's lores screen mode and Paula is more than capable of mixing the fourteen channels of crappy ADPCM sound with little loss in quality (and none if using 14-bit). Of course, the Amiga would have had to blit literally everything to attempt to match the ~400 on-screen sprites and matching the NEOGEO's built-in scaling would be a problem. If the Amiga's blitter had n/16 scaling and chaining, then I would say it would have easily best it. Otherwise, I would say there are pro's and con's on both, with no clear winner. I've actually never understood why HAM wasn't used more -- was the idea of using a fixed RGBG pattern such a radical idea? I mean, then all you need is four shifted copies of each sprite in memory (RGBG, GBGR, BGRG and GRGB) and then you can blit any sprite to any location on screen, enjoying near 12-bits per pixel graphics with the blitter demands of an 8-bit lores screen. Hehe...I like the left more. Both AMIGA and NEO-GEO use slightly different concepts. it has planar and dual playfield modes. and it can also be used very elegantly for Workbench and applications. NEO-GEO has a huge number of very capable sprites. it does support 16 colors per sprite with a total of 65000 colors on screen. NEO-GEO is tweaked a lot for 2D games, and not that useable for Workbench. Both AMIGA and NEO-GEO allowed to make great games. NEO-GEO games has the advantage that they could use a lot more GFX memory, and that animating the background did cost no CPU/Copy time. This allowed to make breathtaking 2D games on the NEO-GEO. NEO-GEO main disadvantage was that games were ROM chip and therefore it was very costly compared to AMIGA. How would preshifted BOBs avoid colour bleeding/corruption? I think I don't get it. A couple of the best ones of that period of time, that is, though..
Pulstar, Samurai Showdown 2, Last Blade, Metal Slug and lots of others are amazing games. There is literally not much on the Amiga which is able to compete with these games, quality wise. Well, the Neo Geo has 380 16 pixel wide, 16 color sprites, each with own palette. There can be 96 sprites horizontally on same vertical line, so this is the real limitation. Compare that to AGA Amigas, with 8 x 64 pix wide sprites with 3 colors, or 4x64 pix with 15 colors. So in 320 pix resolution you can cover almost 5 times screen with sprites in Neo geo, while not even once with AGA in comparable amount of colors. AGA also does not allow for horizontal multiplexing in 32/64 pixel wide sprite modes. The blitter is also very slow, it can maybe make up for same performance as with AGA sprites without vertical multiplexing. Or around 15-20 16x16 pixel sized sprites with 16 colors at 50 fps and not much DMA slowdown. Neo Geo does have to use sprites for a scrolling background though, so two independent layers of sprites cost 40 sprites. While Amiga uses HW support for horizontal scrolling, but some sprites may still be used up due to HW limitations, and some some blitter/CPU time for incoming tile layers. The 68020 14 MHz is slow for graphics, and the 68000 10 MHz used in Neo Geo does not perform any graphic actions, it does just do game logic and such. Mixing together sound samples in real time takes also up a lot of CPU power, you'd need at least a fast 68030 for that and to handle game logic at same time. A fast 68030 operating in fast ram is much faster than blitter for drawing sprites though, not to mention a 68040/68060, so you'd need these to come close to Neo Geo in performance, and even then i suspect the Amiga can't produce as many colors in objects and background as Neo Geo. If you would go in depth, NeoGeo has more then just 10Mhz m68k.Also, its chipset is defenetely superior to Amiga. Comparing similar titles or just plain look at NeoGeo titles shows it. HAM6 and HAM8 were never used so much - because they cannot be used for fast anim and action, just for background pictures and pic displays. Yes, there was better hardware then Amigam even at times. Anyway, it wont matter at all once SAGA is out. But Vojin, all this does not matter at all ones SAGA is out!! Uuuh ambermoon is one example of where you are wrong. Uh duuuh! This is done by fixing the 5th and 6th bitplanes with a constant value. We NEVER change these and do not ever attempt to use the base palette -- this is what causes problems and over-complicates the mode. BOB will only align with the RGBG pattern on every 4th X-coordinate. So you need four rotated images to allow the BOB to be places at any arbitrary X-coordinate. With the Y-interleaving, you then just xor the image model with ((y & 1) << 1). This allows your 12-bit RGB BOB to be placed anywhere on-screen. It's worth mentioning that MOST raster effects would still work in this mode except for the scroll-based scalars. Aside from than, having smooth scrolling, etc, should be fine. And like I said, this is no harder on the DMA than an 8-bit lowres screen while giving us **ALMOST** 12-bpp colour. NEOGEO has two CPU's, a 10MHz 68000 and a 4MHz Z80. The Z80 really adds no additional compute power since it's so slow, but it does allow sound to be precisely timed regardless of what the 68K is doing. These are both very modest processors, even against the 68EC020. The NEOGEO was more specialized at handling sprites, making writing games a bit easier. Amiga's sprite engine was rather lacking and better suited as a fast-scrolling background layer than as player sprites, but I digress. 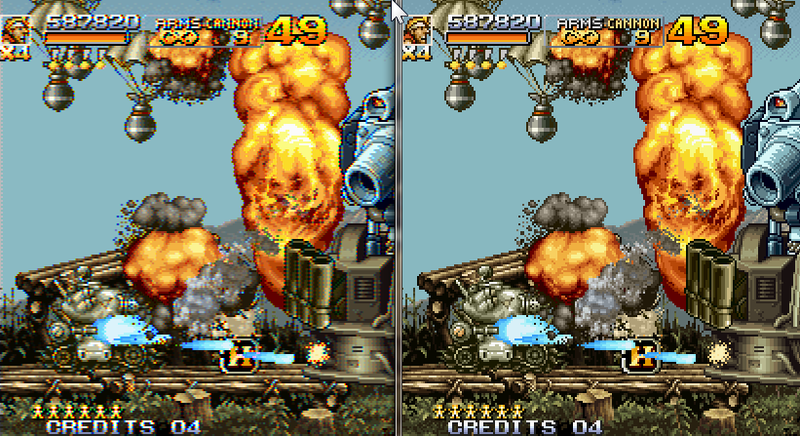 The AGA hardware could absolutely produce higher resolutions with higher colours than the NEOGEO. This is a huge misconception. Making a HAM6 scroller would not have been any harder than a 256-colour one and would have looked mind-blowing-ly superior. The problem was the palette-selector red herring. If you omit that and use a simple RGBG pattern, you make HAM every bit as easy to manage as any other screen mode. You don't even have to use C2P at this point. Your BOBs are pre-C2P'd in memory and you just blit like normal. And if the blitter is "too slow", then the 14MHz 68EC020 can easily make up the difference and still have more CPU power left over than the NEOGEO has. Just because no one did at the time doesn't mean that it couldn't have.